It seems Airbus likes to deliver their planes in Paris, as in the same week a new Airbus A321neo was delivered to British Airways, TAP Portugal accepted their first A330neo! And by first, we mean the first A330neo (A330-900) ever built by Airbus. The program has been a little controversial as sales have been slow for the A330neo program, but Airbus believes now airlines can see it in action they will change their tune! Additionally, it was just revealed that Airbus plans to re-market the A330neo as the new Boeing 797 killer! What can we expect of the A330neo? There are two versions of the A330neo, the A330neo-800 which can travel 7500 nm (Nearly 14,000km) with 257 passengers, and the A330neo-900 which can travel a 6550 nautical miles (Just over 12,000km) with 287 passengers. 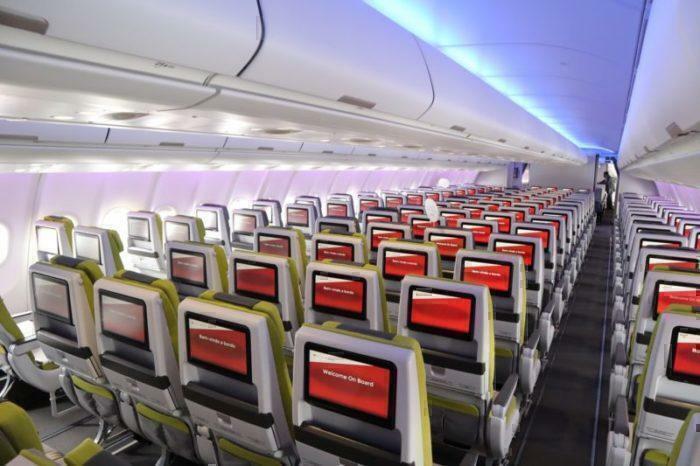 TAP Portugal has used this opportunity to fit out the new A330neo with a whole new interior. There will be a three-class layout with 34 full-flat business class, 96 economy plus and 168 economy class seats. 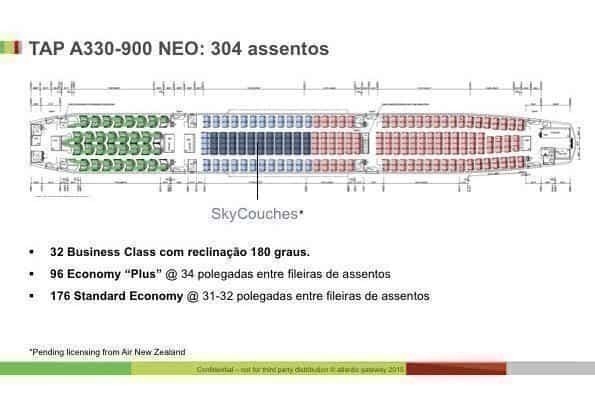 A mock up of the seat layout of the new A330-900neo. There is the ‘Executiva’ section, a business class with lie-flat seats (6 foot 6″ if lying flat), privacy screen and large entertainment screen. Business class passengers are also expected to have complimentary WIFI. The seats will be 22″ wide and 44″ of pitch. They all have direct access to the aisle, but are staggered in a 1-2-1 configuration (As in, every odd row has access to windows, whilst event rows are next to the aisle). Followed by a ‘premium’ economy section called Economy Plus. The seats are 18″ wide and have 34″ of pitch. The ‘plus’ being the additional legroom (3 more inches, wow) and different coloured seats. Economy Plus on the A330neo. 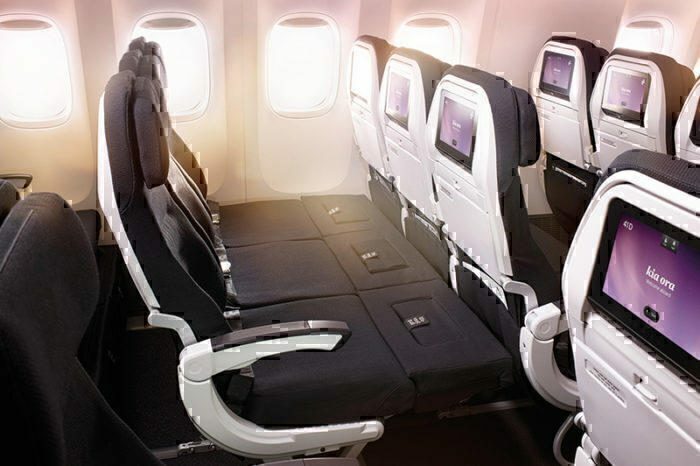 Economy Plus customers can also upgrade to the ‘sky couch’ concept seen on Air New Zealand, a way to convert three economy seats into one lie-flat bed, or potentially an area for families to sit together. The Sky Couch as seen on Air New Zealand. This section will be followed by the standard economy cabin that we see throughout the world. The seats are 18″ wide and have 31″ of pitch. The economy section with setback entertainment screens. What does TAP Portugal think of the A330neo? The CEO of TAP Portugal had this to say at the handover ceremony. 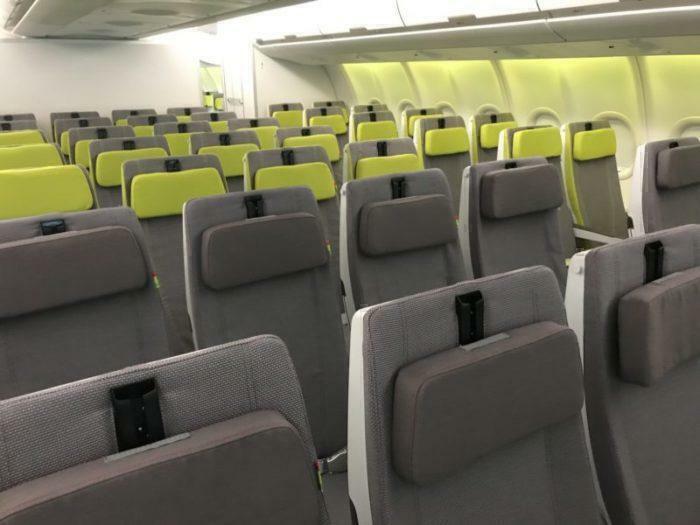 The new plane has not yet received its airline certificate, but TAP Portugal believes it to be a mere formality and will be operational in a few weeks. The new A330neo It incorporates the highly efficient new generation Rolls-Royce Trent 7000 engines, and a new higher span 3D optimized wing with new sharklets fully optimized for the best aerodynamic performance. Together these advances bring a significant reduction in fuel consumption of 25 percent compared with older generation competitor aircraft of a similar size. TAP Portugal has 71 Airbus planes in their fleet (Their only airline provider) and have another 20 Airbus A330-900s on order. What routes could this plane fly on? The first few A330neo’s in TAP Portugal’s fleet will be replacing their ageing A340’s that are primarily their Lisbon to Sao Pablo (Brazil) route. The planes, whilst iconic and beautiful, are actually enormous gas guzzlers. TAP Portugal is also in talks with the EASA and the FAA to obtain all of the needed certifications to fly the A330neo on transatlantic routes from it’s hub in Lisbon. With another 20 A330neos on order, we will soon see TAP Portugal launch new routes to new markets we have not seen before as this plane order represents a significant long haul fleet increase. Will you be flying their new A330neo? Just checked my booking for FEB 5, GRU-LIS, I could not believe, it will be A339 !!!!! TP has changed my previous blocked seats for A332 : 2H and 5K….. but quickly changed for 3E and 3F !!!! Cheers with Alentejano ! Will be selecting my holiday in Spain flights (via Aeroplan) to only include the 339 BOS>LIS & LIS>YYZ. Say “buh-bye” to those old 330-200’s. But do I forgo the window seat to sit next to my wife in the middle?